The collective members of the Galilei family seem to have embodied the principles of Renaissance polymathic curiosity and endeavour. Best known of the clan is the physicist and astronomer Galileo Galilei, whose controversial championing of heliocentrism and Copernicanism aroused the ire of Pope and Inquisition and led to recantation and house arrest. Galileo was no mean lutenist, and his brother Michelangelo also became a noted lutenist and composer; perhaps their fascination with ‘measure’, musical and mathematical, was inherited from their father, Vincenzo Galilei. The latter was a renowned instrumentalist, composer and theorist, whose intellectual and musical talents had been recognised by his teacher, the Florentine Giovanni de’Bardi, who sent his protégé to study with the theorist Gioseffo Zarlino. Zarlino's ideas Vincenzo later challenged in the Dialogo della musica antica and della moderna of 1581. Vincenzo later became a central figure among the humanists who formed the Florentine Camerata, but he remained a practising musician throughout his life, publishing, among other works, lute tabulations and two books of madrigals. His theoretic writings explored counterpoint, musica ficta, text setting, dissonance and tuning systems. In some ways, the Libro d’intavolature di liuto represents the fruition of his scholarship and experimentation. The autograph manuscript, held in the Biblioteca nazionale centrale in Florence, is divided into three parts, the first two of which have two suites of passamezzo, romanesca and saltarello on each of the twelve ascending semitones of the equal-tempered octave. This recording by the Yugoslavian lutenist Žac Ozmo presents sets of passamezzo antico-romansesca antica-saltarello followed by the corresponding passamezzo moderno and romanesca moderna on the first four steps of the scale. Are these theoretical experiments or expressive art works; can they be both? From the first item, the Passamezzo antico from Book 1 No 1, Ozmo shows us that intellectual perspicacity can blend with expressive articulacy. There is a careful precision about the placement of, for example, the spread chords, and the direction-giving bass line, but there are also moments of subtle rubato and delay; and the resonant acoustic of the recording helps to temper any innate ‘dry-ness’ in the musical material. The sound is occasionally a little hard-edged but this allows us to appreciate Ozmo’s technical accuracy. While this disc might appeal most strongly to the lute aficionado there is no lack of communicative variety; nothing to alienate the new-comer. For example, there is a lovely withdrawal of sound in the Romanesca antica Book 1 No 2 which takes us from the Renaissance science laboratory to the poetic reveries of Nicholas Hilliard’s ‘Young Man among Roses’. On a simpler level, the contrast of duple-metre passamezzos and triple-metre romanescos, followed by the relative freedoms of the saltarello dances, provides its own range of varieties. The Passamezzo antico Book 1 No 7 acquires gradual impetus accompanied by expressive melodic and harmonic detail. There are some particularly lovely shifts between major and minor modes, as well as between homophony and counterpoint. The prominence of the upper registers in the Romanesca antica Book 1 No 8 are refreshing; and the sparse textures, yet gentle arguments, of the Saltarello Book 1 No 9 are similarly appealing. More potently, the shift from one degree of the well-tempered scale to the next is wonderfully disconcerting: the Passamezzo antico Book 1 No 4 sounds positively cool and cerebral, and the more animated tempo only increases the intensity. The scalic running motifs seemed designed to prompt intellectual debate, as confirmed by the stolid stepwise approaches to cadences. The tierce de Picardie lifts and brightens, but is quelled by the subsequent Romanesca antica which – with bold invention – after seeming to deny idiosyncrasy, then treats scalic motifs with a degree of freedom. An incipient anarchy is enhanced by the musical theatrics of the tuning. As Ozmo explains, his six-course lute in G tuning – the bottom open string being G – is tuned in equal temperament as advocated by Galilei, with gut strings employed for the fifth and sixth course. This results in clarity of line and less interference from the sustaining bass, but also produces slight fluctuations in tuning – which are most piquantly experienced here. Indeed, this disc invites us constantly to reassess and realign our expectations. The Romanesca antica of Tone II is good example of how ‘clinical’ openings can flourish into melodic then ornamental riches. Similarly, the Passamezzo antico Book 1 No 10 delights in lovely dialogues across registers. The tempi may be prevailingly moderate, but these are justified by the assertion in the Dialogo that ‘the lute and the viola d’arco’ are particularly suited to expressing the grave and serious, ‘like the Dorian mode’. The saltarellos provide lightness – although they are not without their intricacies and rhythmic complexities; Book 1 No 3 indulges in fantasia-like episodes towards the final cadence. There are obviously considerable technical challenges of which Ozmo’s meticulous execution seems to make light. For example, he describes the need to keep the index finger of left hand flat on the fingerboard almost continuously while other fingers dance intricately, which requires great strength and agility. 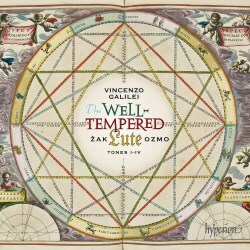 In his engaging liner-notes Ozmo writes of his revelation when discovering the lute in his late teenage years and of his subsequent realisation, and wonder, that art and science can provide consolation and enrichment during times of personal and national adversity: ‘After all, if human beings are capable of creating beauty as reflected in the arts and mathematics, there must still be hope for us all even in the midst of the most terrible darkness’. Wise words, which we might do well to note. This recording reveals both the science behind the scale; and the human expression behind the experiment.